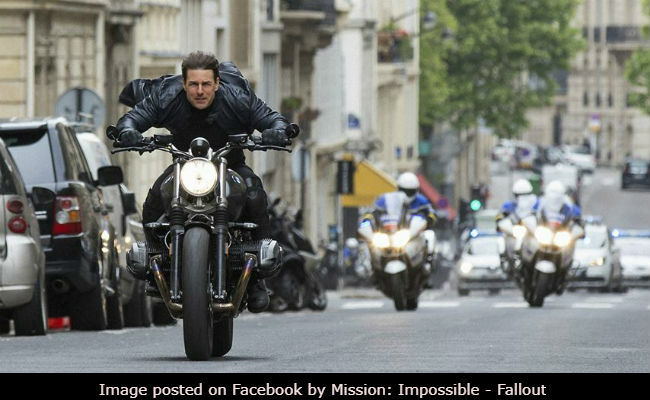 The latest instalment of the Mission Impossible movie series has a motorcycle chase sequence in the heart of Paris, and it seems Tom Cruise has done all the stunts himself, without a helmet, or a safety rig. The 56-year-old star has been known to do many of his stunts himself in earlier Mission Impossible films as well, including several bike chase sequences like the one in the last film, riding a BMW S1000RR in Morocco, and in one of the earlier films riding a Triumph Speed Triple. This time around, Cruise seems to have outdone his earlier motorcycle stunts, and had to perform the chase sequence himself, without even basic safety gear, like a helmet. "I spent a lot of time training for the motorcycle stunts," said Cruise in the video. "We had a safety rig for this challenging shot, and that rig just didn't work. So, I said, we gotta roll, we gotta go, and we gotta shoot. I said, put the camera and get the pursuit, and I'll come around this corner as fast as this bike could possibly go." In the behind the scenes video released by BMW Motorrad, writer and director Christopher McQuarries says the chase sequence around the Arc de Triomphe in Paris was "infinitely more dangerous, infinitely more challenging than the sequence in Rogue Nation." In the latest instalment, called 'Mission Impossible: Fallout', Cruise rides a BMW R nine T on the streets of Paris, where he is chased by police on bikes and cars. Cruise rides around the Arc de Triomphe against the traffic in what is indeed a dramatic motorcycle chase sequence, which ends with him crashing into a car.